Over the last half year I have been working on a third Local History Kit for teachers to use in the classroom. Last spring I worked with our team of SD33 teachers to create lessons around Flooding in Chilliwack. The kit focuses specifically on the floods of 1894 and 1948 which are well represented in our collection. 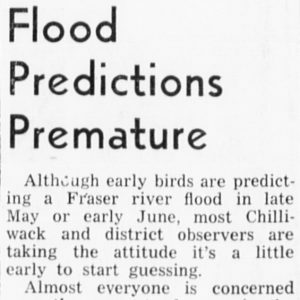 Chilliwack Progress Newspaper Clipping, April 21, 1948, page 5. Flooding has affected many aspects of life in the Fraser Valley. 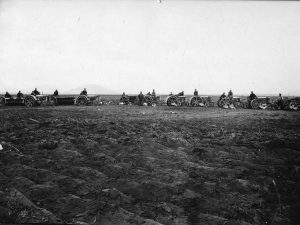 Over the last 150 years since colonization it has resulted in major changes to the landscape around us. Dykes surround many areas of our city and the once Sumas Lake is now drained and pumped into the Fraser River, in part for ongoing flood protection. Learning about the historic flooding in the area helps us to understand the efforts that are made today in flood protection and gain a better understanding of the man-made and natural changes in our landscape. The new kit has students exploring a variety of aspects of historic flooding in Chilliwack. 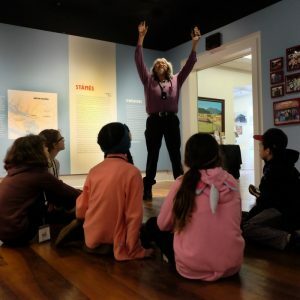 In Grades 1 and 2 students can explore historic photographs to find out how a community comes together during times of emergencies and what changes after a major flood. In Grade 5 students explore the changes to First Nations communities when they were made to settle permanently on reserves, often in unprotected flood zones. In Grade 6 students can look at the consequences of living on a floodplain and investigate emergency preparedness today. “Fight to rescue stock” Chilliwack Progress Newspaper Clipping, June 2, 1948, page 8. 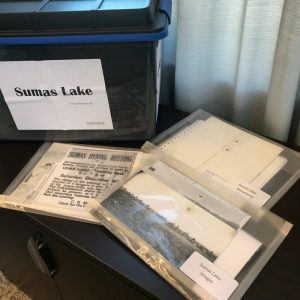 The primary source reproductions in this kit span a wide variety of media, from official reports from the Fraser Valley Rehabilitation Authority to personal handwritten accounts. One of my favourite documents we uncovered during our research is a handwritten account of the 1894 flood by Rory Knight, who lived in Popkum at the time of the flood. At the end of his account he writes, “There was no such luck as no school for Gertie and I as we had Miss Harris and we went to school every-day,” [AM 0029]. 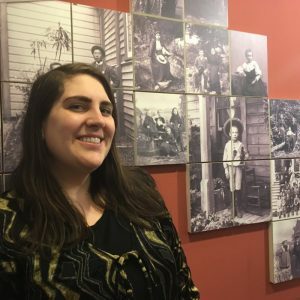 Being able to share personal and local stories like this is what makes these historical events really come alive for students and helps them connect to the bigger ideas they are studying in school. If you’re interested in exploring more about Flooding in Chilliwack you can check out our online exhibit Flooding Chilliwack: A History of High Water. I also found K. J. Watt’s book High Water: Living with the Fraser Floods an invaluable resource while beginning our research for this kit, the book can be accessed in our reference library at the archives. The Flooding Chilliwack kit will be available to book in schools in April 2018. Booking can be done online through our shop or by phone at 604-795-5210. Over the past year we’ve been working on creating our local history kits in collaboration with the Chilliwack School District. 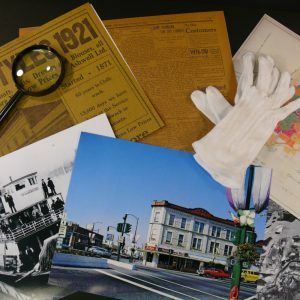 These kits compliment our traditional 1-1.5 hr school programs as they expand on specific local history topics and allow teachers and students the freedom to explore the materials at their own pace. Some of the reproductions in the Community of Villages kit. 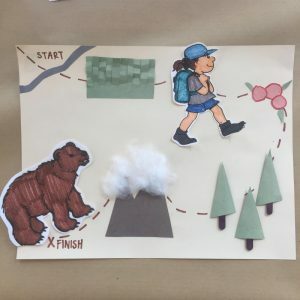 With the new BC Curriculum in full swing this year, these kits focus on helping both teachers and students learn curricular competencies while exploring local topics. The Community of Villages kit specifically focuses on exploring the concept of “Continuity and Change” and helps students learn how to explain why some aspects of their communities have changed over time while others have stayed the same. Sequencing – Have students work together to sequence a series of photographs from oldest to newest. This will get them talking about the quality of the photographs, the clothes people are wearing, the different modes of transportation and so on. Compare and Contrast – Using photographs or newspaper articles, have students compare one from the past and one contemporary example. Have them chart the differences and similarities they can find. 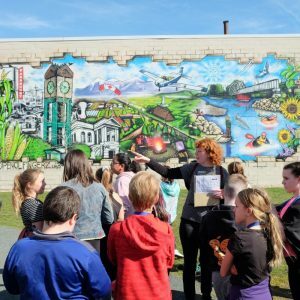 Maps – Have students compare a current map of Chilliwack with an historic one. Questions come naturally about the changes in the city over time. Location Mapping – Have students match historic photos to a current map or vice versa. Get them to locate their home or school on the map to see how their area has changed or stayed the same over time. In many cases, I’ve found that the primary sources speak for themselves and that student’s curiosity is sparked and questions come naturally when they get to interact with the materials first hand. If you have any questions or suggestions about learning with primary sources, feel free to get in touch with me at [email protected]! This past year has been jam packed with Education and Engagement projects. We’ve taken the museum out to events like Canada Day and Party in the Park and updated our hands-on Discovery Bins for children. We’ve been working with School District 33 to create local history kits and completed our first kit on Chilliwack’s Chinatowns. We’ve also updated our school programs to fit with the new BC Curriculum and hosted a number of speakers and events in the museum. 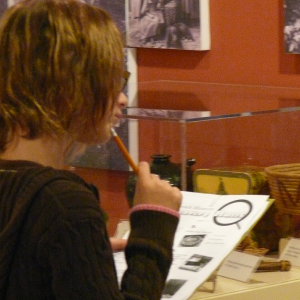 We’re working on developing a new Archives based program for Middle and High School students. This program will focus on introducing students to the archives and how to access and interpret primary sources. 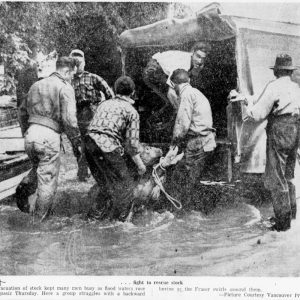 Continuing to work on local history kits with the school district, we are currently focusing on developing resources on the floods of both 1894 and 1948 in the Fraser Valley. 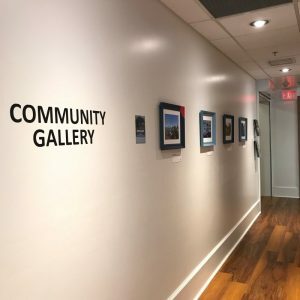 This past fall we’ve been working with a group of Grade 6 students on an education project based on our current exhibit Photography from Obscura to App. Starting on February 9th we will be exhibiting students’ photographs at the museum. These will be on display until June 11th when Photography from Obscura to App closes. 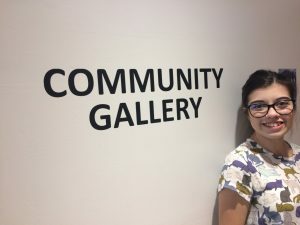 As the host organization for the BC Historical Federation conference in May we are helping to plan a series of interesting workshops, field trips and lectures that will highlight our city and its diverse history. As the year progresses we’ll be looking to continue scheduling events and activities for all ages. Don’t forget to check our Events Calendar or follow us on Facebook, Twitter or Instagram to find out what’s happening at the museum! 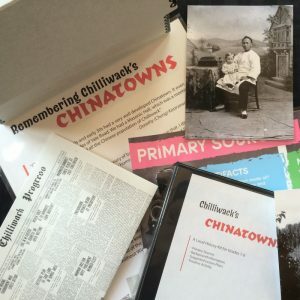 Introducing our first Local History Kit – Chilliwack’s Chinatowns! I have been working on developing local history resources with an amazing team of SD33 teachers this past year. 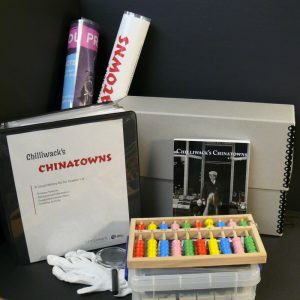 I am excited to announce that our first kit on Chilliwack’s Chinatowns is now ready for teachers and educators to book! The Local History Kits came about through collaboration between the Chilliwack Museum and Archives and the Chilliwack School District. 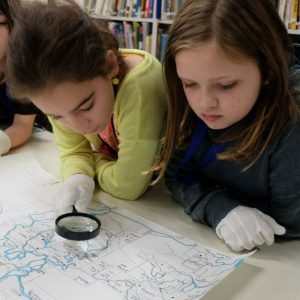 When reviewing the redesigned curriculum, the focus on local content and place-based learning created the perfect opportunity to use the resources that already exist at our museum and archives, and get them in the hands of students! The Chilliwack’s Chinatowns Kit comes with primary source reproductions, posters and a teacher guidebook. 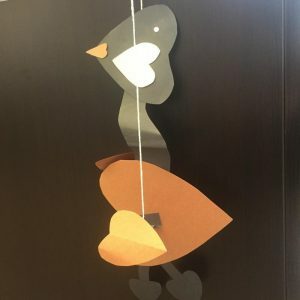 The partnership involved a team of teachers across different grades to tap into the resources and connect them in a meaningful way to the new curriculum. The kit includes lessons and activities that are designed to address Big Ideas, Curricular Competencies and Content in a variety of subjects and grades. The aim is that when teachers use this kit in their classroom, students will be developing critical thinking skills while using meaningful, relevant, local materials. Kits come with primary source reproductions relating to each specific topic, background information, timelines and supplementary materials needed to teach each lesson. They are now available to book here for $15/week or, if you are a SD33 teacher, you can contact the school district office to book the SD33 copy. We are looking forward to receiving feedback from teachers to help us improve these kits and make them as student and teacher friendly as possible! Having completed the kit on Chilliwack’s Chinatowns, we are now working on gathering resources on Flooding in Chilliwack, focusing on the 1894 and 1948 floods. As well, we are developing a kit for Grade 7 classes on key developments in our local community. Stay tuned to find out when these kits will be available!